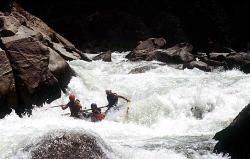 The Main Tuolumne and Cherry Creek are classic California whitewater rafting runs. The Tuolumne is an advanced Class IV-V river and the Creek is V+, experts only. The Main Tuolumne and Cherry Creek are located 30 minutes west of Yosemite National Park, with some of the best California whitewater rafting in the Sierra Nevada foothills. Portions of www.Tuolumne-Rivers.com were excerpted from California Whitewater by Jim Cassady and Fryar Calhoun. Excerpts were also borrowed from The Best Whitewater in California, written by Lars Holbek and Chuck Stanley. To find out how to purchase these California whitewater rafting guidebooks, visit the "About the Books Page" for more information. This website was designed to provide logistical information for whitewater rafting trips on the Main Tuolumne and Cherry Creek. The information found in this website cannot replace the needed skills learned over many years and thousands of river miles. Consider contacting a commercial outfitter.